At an age when most kids are playing video games, learning to drive, doing homework and squeezing in sports practice, Chris Zane had already started a business. At 12-years-old, he was raking in a few hundred dollars a week fixing bikes. When his father suggested he could get wholesale parts cheaper with a tax identification number, he filed for one. And just four short years later, at age 16, he arranged a loan with his grandfather to buy a neighborhood bike shop. Today, Zane’s Cycles has annual revenues in excess of $15 million and an annual growth rate of almost 24 percent. 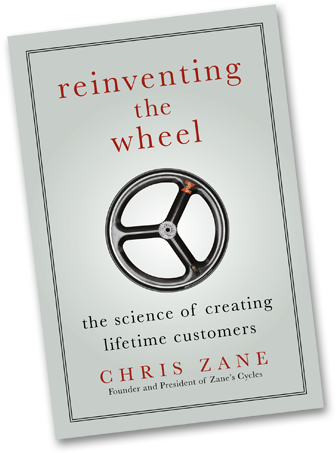 In his first book, REINVENTING THE WHEEL: The Science of Creating Lifetime Customers (BenBella Books; hardcover; March 1, 2011), Zane shares the business philosophy that put him on the map and took Zane’s Cycles from a small, teenage dream to a multimillion-dollar business. The secret, Zane reveals, is extraordinary customer service and the ability to over-exceed customers’ expectations – with offerings including a lifetime free-service guarantee; a custom coffee bar, where cyclists can share stories of their rides over a cup of cappuccino on the house; parts under a dollar for free; full refunds with no questions asked, regardless of the age of the bike; free flat-tire fixing service; and a trade-in program for children’s bikes that have been outgrown. The result is lifetime customers, with each customer valued at $12,500 to the company. These truly revolutionary services are what gained Zane’s Cycles its fanatical following and catapulted Chris Zane into national recognition – in an American Express commercial, featuring successful entrepreneurs, and on the stage, keynoting for businesses and industries hoping to make customer service their hallmark. In this virtual age, when so many transactions happen without a human being involved at all, the key is to find an emotional connection between your customer and a live salesperson, who takes the time to listen to the customer’s concerns and need. End nickel and diming. They don’t charge for any part that costs $1 or less. It shows we aren’t interest in writing every last penny from our customers. Walk the Walk. A customer came in with a six-year-old bike, demanding a full refund. Zane’s happily honored the unconditional return policy, despite the obvious wear and tear and use of the bike. The customer ended up applying the refund to a much more costly bike. In addition to serving his customers, both retail and corporate, Zane has become a responsible and involved member of the community – from sponsoring rides and community events, to providing children’s helmets at cost (of course, emblazoned with a Zane’s sticker) via the local PTAs, when helmet laws went into effect. Zane’s Cycles routinely hands out free bike locks at the Yale University campus when school begins in the fall, and they fund scholarships for local high school students by collecting money in bubble gum machines installed around town. REINVENTING THE WHEEL is an inspiring and instructive look at how one boy’s passion created a lifetime of reward – for him, his employees, his customers and the community.